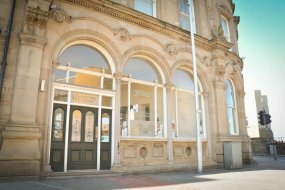 Queen’s Court Business Centre is a short distance away from Barnsley Bus Station on Regent Street. The Business Centre is home to our Work Based Learning, External Funding and Projects, and Warehousing, Logistics and Work Force Development teams. The Work Based Learning department provide bespoke recruitment and training packages to businesses throughout the region, including apprenticeships. They offer over 80 apprenticeship pathways across all industries. The External Funding and Projects team secures capital and revenue external funding to support the college’s vision “to be a world class tertiary college” and achieve its strategic priorities. The team develop and maintain key strategic partnerships with many external organisations locally and more widely at the regional and national level. The Warehousing, Logistics and Work Force Development department deliver a range of work preparation and training courses for businesses across South Yorkshire.